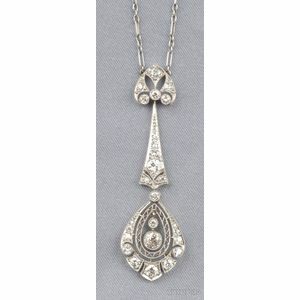 Art Deco Platinum and Diamond Pendant Necklace, set with old European-cut diamonds, fine pierced work, and millegrain accents, suspended from paperclip chain, lg. 1 7/8 in. approx. total wt. 0.80 cts. Nice, lively old stones, and without visible issues.